Several times in the past, we've discussed the rules of the film sequel, the most basic of which is "Bigger is better". When it comes to films based on pre-existing material, there is an additional rule, which I think of as the "Scooby-Doo Rule". You see, the 2002 live-action Scooby-Doo movie wasn't very good for several reasons, number-one being that it strayed too far from the source material and didn't satisfy the fans. With Scooby-Doo 2, the filmmakers brought in more elements from the classic TV shows and gave the fans what they wanted. (It wasn't a very good movie either, but at least they tried.) We get something similar with the recent live-action Teenage Mutant Ninja Turtles movies. The 2014 reboot has some positive attributes, but it strayed too far from the original comics and beloved cartoon. Can fixing those mistakes make Teenage Mutant Ninja Turtles: Out of the Shadows a better movie? 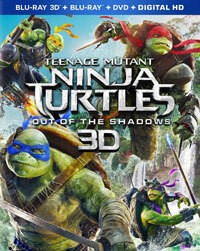 Teenage Mutant Ninja Turtles: Out of the Shadows begins following the events of the first film. Despite the fact that the Teenage Mutant Ninja Turtles -- Leonard (voiced by Pete Ploszek), Raphael (voiced by Alan Ritchson), Donatello (voice by Jeremy Howard), and Michelangelo (voiced by Noel Fisher) -- defeated Shredder (Brian Tee) and saved New York, they must remain hidden, so Vern Fenwick (Will Arnett) was given credit. The Turtles are still working with April O'Neil (Megan Fox), a reporter who is trying to get information on a scientist named Baxter Stockman (Tyler Perry). April is able to track Stockman and learn that he's working on a secret project. Meanwhile, the convoy carrying Shredder to a new prison is attacked, rendering prison guard Casey Jones (Stephen Amell) helpless. The Turtles come to the rescue, but they are too late, as Shredder has disappeared. Little do they know that Shredder has gone to another dimension, where he will strike a bargain which get result in the end of the Turtles and the world. I don't know about you, but it's very rare that I feel like Hollywood listens to moviegoers. (I keep asking for good movies and they keep denying me!) However, it's very clear that the team behind the Teenage Mutant Ninja Turtles franchise listened loud and clear to the fans. Despite the fact that the first film brought in $190 million in the U.S. alone, it got pretty bad reviews and the faithful voiced their concerns over changes made from the original material. (Actually, thanks to internet rumors, they voiced their concerns long before the movie opened.) People who grew up with the comic books and especially the 1980s TV show felt that this new interpretation simply fell short. So, Teenage Mutant Ninja Turtles: Out of the Shadows liberally pours on characters from the TV show and comics: Casey Jones, Baxter Stockman, Krang (voiced by Brad Garrett), Bebop (Gary Anthony Williams), and Rocksteady (Stephen Farrelly). (And the Technodrome!) I wouldn't say that this was an apology, but it was clearly an acquiescing. However, an influx of classic characters can’t change this film’s pedigree. We still get a Michael Bay-produced over-the-top action movie which may cater to the whims of the fans by brining in some familiar names, but it still clearly has its own agenda. It’s clear that those involved want to make a companion-piece to the Transformers movies and have little interest in creating a movie which stays true to the Turtles brand. Therefore, we get a long action set-piece which takes place in South America, beginning in mid-air and concluding several minutes later in a river. Who came here to watch the Turtles be world travelers? As noted, Casey Jones is in the film, but he never fights along-side the Turtles. The final fight short is actually somewhat short when compared to other Bay projects, but it still goes on for too long and is never very interesting. Shredder is in the movie, but he doesn’t really do anything villainous. The movie thinks that it’s giving the Turtles a lot of distinct and individual personality traits, but just as in the first film, they become interchangeable after a while. In my review for the 2014 film, I mentioned that I went through my Turtles phase, and part of me would like to see a really good movie based on the franchise. Unfortunately, this isn’t it. Again, give those in charge credit for hustling in those well-known characters, but once they arrive, it’s like they don’t know what to do with them. As with the first film, I hate the look of these Turtles. Their faces are weird, their shells are weird, and why are they dressed like hobos? Director David Green gives the action scenes a slick look and the movie is well-paced, but it just becomes noise after a while. In some ways, this is better than the first film, but that’s not saying much. And now we come to the biggest question -- What is Laura Linney doing in this? Teenage Mutant Ninja Turtles: Out of the Shadows tried to convince me that the Turtles like the NBA on Blu-ray Disc courtesy of Paramount Home Entertainment. The film has been letterboxed at 2.35:1 and the Disc contains an AVC 1080p HD transfer which runs at an average of 22 Mbps. The image is very sharp and clear, showing on noticeable grain and no defects from the source materials. The colors look very good and the image is never overly dark or bright. The level of detail is notable, but this does render the Turtles somewhat waxy at times, and the depth is impressive, even in this 2D version. The Disc carries a Dolby Atmos 7.1 audio track which runs at 48 kHz and an average of 6.5 Mbps. The track provides clear dialogue and sound effects. The stereo and surround effects shine during the action sequences, as we are treated to detailed audio which highlights sounds coming from off-screen. We are placed in the middle of the action here. The subwoofer effects shine as well, and the finale delivers wall-shaking sounds. This set also includes a Blu-ray 3D where the film has been letterboxed at 2.35:1 and the Disc contains a MVC 1080p HD transfer which runs at an average of 25/12 Mbps. The depth here is quite impressive and we get a minimum of blurring in the action sequences. The finale is loaded with multiple layers and looks great. The colors remain stable here and the image is not dark. The menu states that the audio here is Dolby Atmos, but my player reported that it was simply a Dolby Digital 5.1 track, which delivered OK sound, but nothing like the 7.1 track. The Teenage Mutant Ninja Turtles: Out of the Shadows Blu-ray Disc contains a few extras. "We Are Family" (8 minutes) takes us on-set to see the actors who play the Turtles in their motion-capture gear and we get to hear from those actors as well. "Whoa! Expanding the Turtleverse" (14 minutes) explores the introduction of the new characters who are brought in for this film. We get a tour of the new Turtles' lair set in "House Party" (6 minutes). "It's Tricky: Inside the Van" (4 minutes) gives us a tour of the Turtle's decked-out garbage truck. "ILM - The Effects Beneath the Shell" (3 minutes) is a reel of various shots showing how the various visual effects were layered. "Did You Catch That? Turtle Eggs!" (3 minutes) is slightly interesting, but not nearly as detailed as it could have been. The Disc contains three DELETED SCENES which run about 5 minutes.